Connecting the Narratives of Slovakia, Hungary & China | Jordan Ink. I’ve spent the past three fall semesters teaching in Hong Kong – “China with an asterisk,” I call it – and explored a sizable chunk of the mainland. Like last October, when a former journalism student and I ventured to Wenzhou, to profile a city that was scene of the deadly, July 23 high-speed train crash. A fatal combination of lightning strike, technical malfunction and human error caused the train plunge off a viaduct, killing up to 40 commuters. The world’s emerging superpower was traumatized, spewing rage into the Chinese blogosphere about how Beijing’s blistering pace of modernization shows reckless disregard for ordinary folk. Then, on March 12 – just weeks after China’s Ministry of Railways ramped up hundreds of billions of dollars’ worth of new high-speed rail line – official media conceded a section collapsed amid heavy rain. 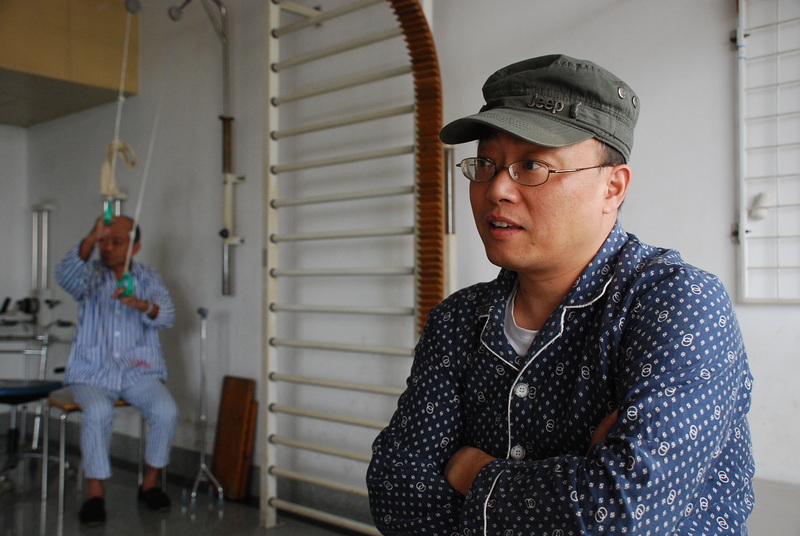 I recalled the words of Li Yu, a Wenzhou train-crash victim, whom we interviewed – and I photographed during his physical-therapy session to rehabilitate a crushed right foot. Near the end of our visit, Yu lamented how little lives are valued in the world’s most populous country. China is already rattled by the people-power that drove the Arab Spring, and, post-Wenzhou, is whittling away at social media. When, if ever, will we see a tipping point for the Chinese public? Finally, there was Hungary. Oh, Hungary! Forever in my blood – and that of my children. My father was born there, I lived there for six years, my wife’s from there, and my kids enjoy dual citizenship. So, yes, I have a vested interest in its present and future. Still, I worry I’m too rough on the place, focusing unfairly on the unflattering. Although last year, I produced comeback-kid narratives here and here after a toxic spill of “red sludge” killed 10 Hungarians. Still, Hungary has clearly slipped from post-Communist front-runner to the region’s bad boy, in terms of its sickly economy, noxious politics and cowed media. The capper was a “constitutional coup” sealed in January by a ravenous government wielding absolute parliamentary majority. Brussels howled in protest. Hungary, after all, had for years banged on the door of the exclusive European Union – to join the “winning side” of the Cold War – which it finally did in 2004. Last week’s Hungary news began with a spark of hope. A Hungarian court rules that the country’s most independent-minded radio station, Klub Radio, could continue to broadcast despite efforts to seize its license. Then came March 15, and national commemoration of the Hungarian role in the 1848 revolutions against Vienna and the Habsburg Monarchy. Hungary’s pugnacious premier, Viktor Orban, let loose with what may be par for the course for his domestic speeches, but reads from afar as nothing less than an anti-Europe diatribe comprised of a frightening mix of paranoia and delusion, megalomania and more scapegoating. He drew repeated parallels between today and not only the 1848 uprising, but the bloody 1956 Hungarian Revolution against the Soviet empire and its Communist puppets in Budapest. Perhaps Orban has little left to offer his supporters beyond the bunker of angry, fearful, us-versus-them isolation: If only the world unshackled us, we would soar. From a far-right crank, it’s understandable. But from the leader of an EU state? Unacceptable. European Commission President José Manuel Barroso responded in kind. “Those who compare the EU to the USSR show a complete lack of understanding of what democracy is and show a lack of respect for those who have fought for freedom and democracy,” said his spokeswoman. Slovakia, China, Hungary … This fan, for one, hopes there’ll be better weeks ahead. I think, that those video´s – there is no comment needed. As far as comparisons with the USSR go, the EU is also looking to concentrate power with unelected apparatchiks, whose decisions will not be subject to either scrutiny or audit – this is what the bailout funds are all about. Concentration of power always turns out bad as we know, all the more so when unelected apparatchiks are involved. More subsidiarity please Mr. Barosso, less cant. Yes, Slovaks have light years to go in the tolerance stakes and if their state is bankrupted by supporting failed ClubMed economies, I don’t think this will be a good outcome vis-a-vis racial harmony.